Back in September we had a small summer party for work. One of my coworkers always offers up his yard/house to us and we hire a friend of his to do the catering. One of the things the caterer made for the party this time was a corn and black bean salsa that was just incredible. I’ve never had a salsa that good before. He used all fresh ingredients and you could really taste it in the recipe. I asked him what he did to get that hint of sweetness and he said that he removed the kernels from a corn cob, sprinkled sugar over them and then roasted the kernels for 10 minutes. Genius! While I would have loved to make this with all fresh ingredients (and I guarantee you I will) I happened to end up with a half can of corn, black beans and diced tomatoes in my refrigerator all at once. With no Mexican dishes on the menu for the week, I knew these ingredients would go bad if I didn’t use them up. 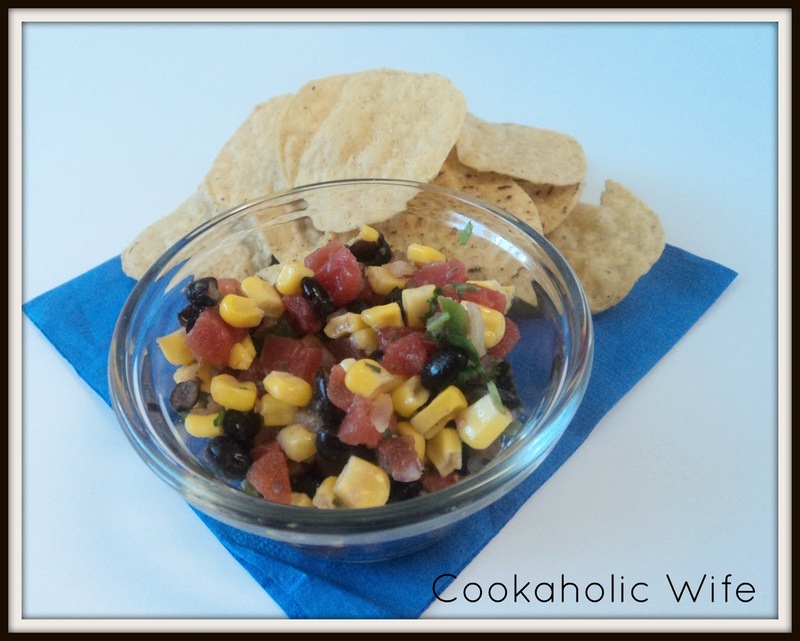 So I decided to create the canned version of that delicious corn and black bean salsa. 1. Preheat oven to 425. Line a baking sheet with foil. 2. Spread out the corn into an even layer on the baking sheet. Sprinkle the sugar over the corn and roast for 10 minutes in the oven. Let cool to room temperature. 3. Meanwhile, combine the black beans, tomatoes, red onion, jalapeno and cilantro together in a bowl. Add the cooled corn and stir to combine. Sprinkle with salt and lime juice and refrigerate until ready to use. I gotta say, this was pretty close to the fresh version we had at the summer party and oh so tasty. I think I’m going to have a hard time sharing this with anyone else.